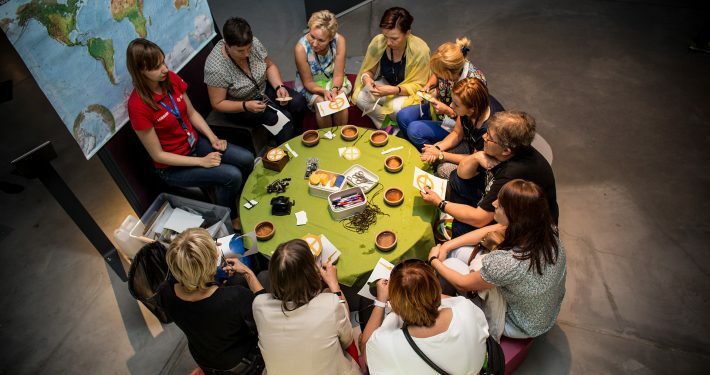 The aim of the Copernicus Science Centre’s activity is to build scientific and social capital and to bring about a shift in the culture of learning, by engaging society, in particular our visitors, in a range of activities and by carrying out research and development work in this field. The wide range of activities offered by Copernicus Science Centre have turned out to be incredibly attractive to the public. Over 6 million visitors have experimented, attended laboratory classes, and participated in various workshops since the opening of Copernicus in 2010. From 2013 to 2015, Copernicus embarked upon a joint project with the Polish Ministry of Education, aiming to encourage teachers to use more active methods of working with their students. Our ambition for Polish schools is to foster curiosity and enquiry, and encourage students to independently learn about the world and make the most of their potential. Twenty-first century schools must adapt to the rapidly changing world in a rational, driven and creative way. Teaching methods focused on active student participation help develop core skills demanded by contemporary society. This project was a major step towards implementing changes to Poland’s education system. The recommendations delivered to the Ministry of Education concerned the equipment, infrastructure, lesson structure, and development of teaching skills at natural science labs in elementary schools. We work closely with the Ministry of Education, local authorities, and other institutions and organizations to disseminate modifications to the teaching of natural sciences, to develop key competencies, and to make sure those changes are enduring. The experience we have gained through working with children in grades 4–6 of elementary school will also be used to introduce changes in early stage education. The recommendations for New natural science workshops have been prepared by a team of experts in many scientific fields representing various circles of formal and informal education. A key stage of implementing the project was combining theory with practice. We selected elementary schools in urban and rural areas in different regions of Poland to pilot the proposed program, introducing the amended teaching methods and suggested activities. Our in-depth proposal for educational solutions beneficial to the development of teaching natural sciences has been published in the volume New Natural Science Workshops, including descriptions of working methods during lessons, example activities, model lesson plans, and a list of equipment tested at our laboratories. We worked with teachers for several months to verify whether students are able to independently conduct the experiments designed by our team of experts and to appraise the usefulness and potential of the equipment. The pilot scheme also included evaluation and a research project. We observed over 500 natural science lessons to establish how teachers work with students and identify the teaching methods and aids they use. Another way for disseminating the scientific method in education is our Young Explorer Club (YEC) program, started in 2009. The program has been rapidly gaining popularity in Poland, as well as being successfully introduced abroad. The clubs provide kids with opportunities to conduct experiments and have fun while learning in a relaxed atmosphere. Young experimenters are able to independently verify research hypotheses without being tested and given marks. The clubs are run by adults, teachers, and other educators, such as cultural workers, librarians, scientists, and parents. The leaders are active, responsible and ready to learn themselves, and they use their potential to the fullest by becoming YEC ambassadors and drivers of change in the culture of teaching. Copernicus Science Centre looks after its expansion and development, maintains contact with members, and bolsters the club network in Poland and abroad. Over 500 clubs are currently active in Poland, Georgia, Ukraine, and Belarus. This high number of members means enormous diversity. Clubs are active in cities and villages, at schools, homes, and libraries, with club members ranging from preschoolers to high school students. To make the most of the program’s potential, we work closely with regional partners who maintain regular contact with clubs in the region and support local leaders in setting up new ones. Another important role is securing local resources to be used together with club leaders. With the support of our partners, we developed educational tools based on the YEC method and now disseminate them through workshops by making them available online and by recruiting and training instructors. The Copernicus team members are active participants in the lives of science centers and institutions working on development that is based on education, science, technology, and innovation. We build links within the group, work toward common goals, exchange experiences, and plan long-term collaborations. We also build partnerships, and this year we started conducting research alongside leading scientific institutions in Poland. In 2007, we launched the conference “Interaction—Integration,” beginning the integration of informal discussion groups/task forces that had created the Society and Science Agreement (SPiN) in 2013. SPiN is a network of 36 science centers and other institutions in Poland working in informal education. We continue participating in the conference organized by a different member of SPiN each year. The original research now being done at Copernicus Science Centre is innovative and will continue to be so in the future. Science centers are ideal venues for studying the mechanisms of learning and cognitive processes in children and adults. They act as laboratories for researching how people behave as they learn about the world around them. Studying the ways visitors explore and use our exhibits is a source of unique information on the role played by science centers in learning and development processes in people of all ages and levels of education. We are especially interested in how these processes occur in children. 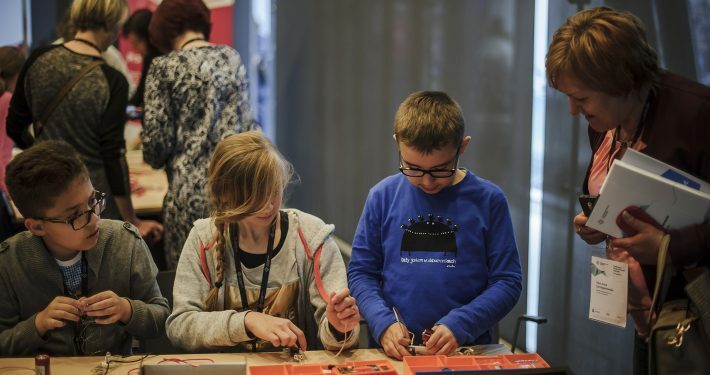 Understanding how kids learn at our labs, what they do at the exhibitions, and how they use exhibits help us to develop educational programs and aids which are already changing the culture of learning in Poland.